AirBridgeCargo Airlines (ABC) has become the first airline in Russia and the seventh in the world to be awarded IATA’s Center of Excellence for Validators in Pharmaceutical Logistics (CEIV Pharma) certification for the global transportation of pharma products via its cargo hub in Sheremetyevo, Moscow. The transportation of temperature sensitive pharma shipments is one of the fastest-growing air cargo markets, driven by global demand for healthcare and life science products. In order to comply with strict international standards, the world’s leading pharma companies need to work with high quality air cargo service providers that can ensure the integrity of their products through the quality of their delivery, handling and storage solutions. This vital supply chain helps to ensure the health and wellbeing of people of all ages all over the world. “Good health is one of our core corporate values so we clearly understand the importance of this certification. IATA CEIV is a confirmation that our quality procedures for the transportation of pharma products, including temperature sensitive goods, fully comply with IATA’s standards. Every player in the pharma supply chain must follow strict procedures to ensure products reach consumers in good time and in perfect condition. We are proud that AirBridgeCargo was able to complete its preparation for CEIV certification within just four months and successfully passed the IATA audit. As part of this, we have also delivered specialist pharma training to 200 of our employees. This is one of the first steps on the way to ABC becoming a leading carrier of pharma goods for our customers around the world. “We are confident that this confirmation of our competency and expertise will allow us to increase our volumes of pharma products across our international route network, including imports and exports to/from Russia. It will also help us to attract additional transit cargo via Sheremetyevo airport on the Europe-Asia trade lane. Through our team’s efforts aimed at the development and promotion of competitive and high quality services, we also hope to attract new business from customers that currently choose to use ground transportation services,” said Sergey Lazarev, General Director of AirBridgeCargo Airlines. The realization of AirBridgeCargo’s plans will also depend on the support of its key partners. 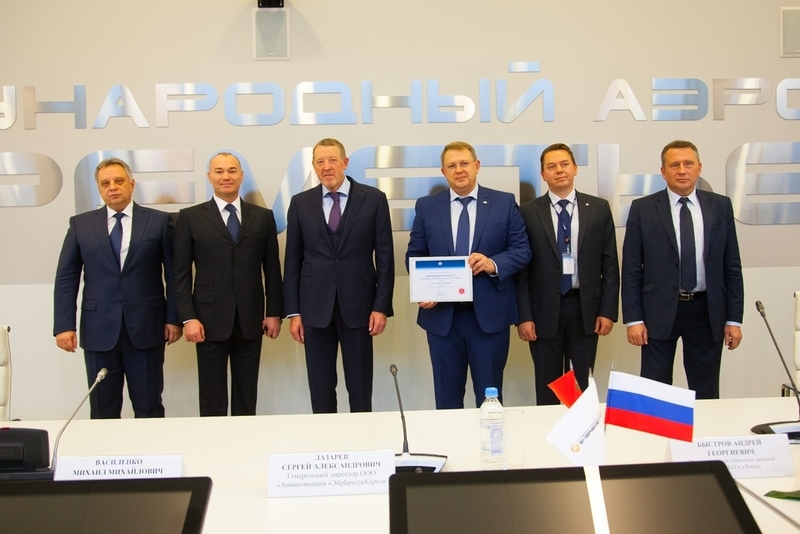 The award of this CEIV Pharma certification is an important milestone in the successful development of the strategic partnership between Volga-Dnepr Group and Sheremeteyevo International Airport, which is focused on long-term and mutually beneficial cooperation to develop the airport’s role as an international cargo hub in Moscow. Joint compliance with the CEIV standards by both the airline and airport will help to raise the airfreight market for pharma shipments in Russia to a new level, delivering a globally-recognized level of service for customers shipping temperature-sensitive medical goods. “The ambitious target pursued by AirBridgeCargo in creating a pharma hub along with obtaining the CEIV Pharma certification will be supported by the large-scale development program of Sheremetyevo International Airport. As part of this program, a new 47,000 sq. m automated cargo terminal will be commissioned in 2017. The $85 million terminal will initially be capable of handling up to 380,000 tons a year with a future potential to expand to 1 million tons a year. We are set on building the largest cargo hub in Europe to meet the growing market needs and create favorable conditions for long-term success of our partner airlines,” said Mikhail Vasilenko, CEO of Sheremetyevo International Airport. On 22 November, Andrey Bystrov, Manager Aviation Solutions IATA, Russia branch office officially presented AirBridgeCargo’s IATA CEIV Pharma certificate to Sergey Lazarev.